How Does Frozen Ground Form? What is the ground like when it freezes? What conditions cause it to freeze, and to stay frozen? A very famous New Year's Eve football game helps illustrate the answers. 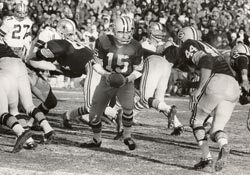 On December 31, 1967, the Green Bay Packers and the Dallas Cowboys competed for the National Football League Championship in Green Bay, Wisconsin. Temperatures that day were cold, as low as -25° Celsius (-13º Fahrenheit). The players noticed that the football field under their feet became hard, so their cleated shoes could not dig into the normally soft soil. The players slipped and struggled to stay on their feet. Why? The ground had frozen solid. The athletes were experiencing frozen ground firsthand. The historic game came to be known as the Ice Bowl (Figure 1). Why does the ground freeze? What does it mean to say that the ground has frozen solid? It means that water between the rocks, soil, and pebbles, and even inside the rocks, has frozen. This frozen water is called pore ice. The ground freezes when the water in the ground becomes ice, as it did during the Ice Bowl. The ground thaws when the pore ice melts. Note that when talking about frozen ground thawing, scientists do not use the word "melt." That term refers to a solid becoming a liquid. When frozen soil thaws, it is still a solid. Figure 2. 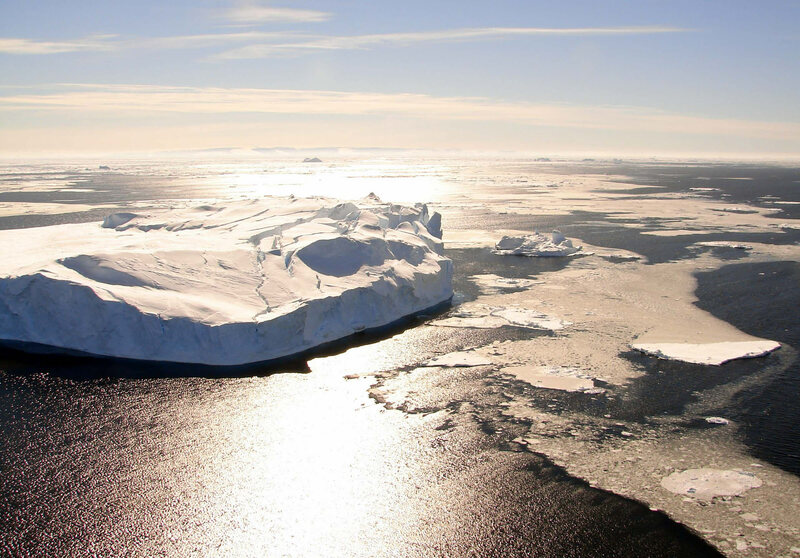 This giant iceberg floats in the ocean near Antarctica because ice is less dense than liquid water. How does water change to ice inside the ground? Water, like all types of matter, freezes at a specific temperature. The freezing point for water is 0 degrees Celsius (32 degrees Fahrenheit). When the temperature of water falls to 0 degrees Celsius and below, it begins to change to ice. As it freezes, it releases heat to its surroundings. However, in some ways water is not like other types of matter. The same amount of water fills more space once it has turned to ice. Scientists use the word density, saying that liquid water is more dense than ice. Because ice is not as dense as water, it floats. You can see this when you put ice cubes in a glass of water: they float. The same is true of icebergs, which float in the ocean (Figure 2). What does the density of water have to do with frozen ground? When water turns into ice, it can expand with great force. Ice forming in the soil pushes on the ground, causing it to swell. People who live in areas with a cold winter season know that frozen ground can damage roads. For example, water turning to ice under roads sometime creates frost heave. The expanding ice pushes up the road and creates a hump. When water freezes and then melts, it helps create potholes and sunken sections in a roadway. Sometimes, in very cold places, a layer of pure ice forms under the soil. This layer is called segregated ice—it is not mixed in with the soil (Figure 3). Segregated ice can be a few meters (up to 10 feet) thick. Segregated ice forms when pore ice attracts water, which freezes and attracts even more water. This effect is called cryosuction. Cryosuction makes the frozen layer grow, and the growing layer expands the soil even more. Cryosuction can make permanently frozen ground expand by 50 percent. Figure 3. The thin, grayish layers near the knees of the person in the photograph are segregated ice. Above the ice are layers of sediment. Are all of the layers underground the same temperature? When the temperature of the ground drops below 0° Celsius (32° Fahrenheit), it freezes. However, the ground temperature can be different from the temperature of the air above it. Layers deep within the ground may be colder or warmer than layers near the surface of the ground. The top layer of ground may respond to conditions on the surface, but the layers below may not change as quickly. On a warm summer day, the surface of the ground can absorb heat and become hotter than the air. But the temperature a meter (a few feet) underground may be much lower than the air. In the winter, the opposite happens. The surface of the ground cools, but the layer deep underground may stay warmer than the surface. The upper layer of ground stops heat from moving between the cold air and the deeper layers of the ground. As a result, the ground insulates itself. The ground is not the only thing that insulates itself from the air. For example, imagine a lake on a hot summer day. The first few feet of the lake will be warm. But closer to the bottom of the lake, the water will be much cooler. The Sun's heat has less effect on the water deeper below the surface. This layering of temperatures is called a temperature gradient. The summer temperature gradient in a cold place like Fairbanks, Alaska, might look like this: the air temperature is above freezing, the ground surface is above freezing, but deeper layers of the ground are permanently frozen. Figure 4. This diagram shows how the Earth's atmosphere and the ground reflects and absorbs the Sun's energy. The type of soil in an area also affects how the ground will store heat. Loose soils like sand have more space for water. In loose soils with large particles, ice forms more easily. Dense soils with small particles do not have as much space for water. Clay, for example, does not freeze as easily as sand. How deep can the ground freeze? How deep the ground will freeze can depend a lot on the length of time that the air is cold. The longer the cold period, the deeper the ground will freeze. But the depth of frozen ground is limited, because Earth is warm deep inside. Most of Earth's heat comes from the Sun (Figure 4). The ground stores a lot of the Sun's heat and reflects the rest into the air. Snow and ice are light colored and reflect more heat away. Ocean water and bare ground reflect less heat, instead absorbing it. This transfer of heat between the ground and the air is called the surface energy flux. Heat is also coming from the inside of the Earth. The Earth's core is very hot, and its heat moves towards the surface (Figure 5). This movement of heat to the surface is called the geothermal heat flux. The geothermal heat flux can stop the ground from freezing. Even in very cold areas, the ground can only freeze so far before the geothermal heat flux stops it. Figure 5. Deep inside, the Earth is hot. 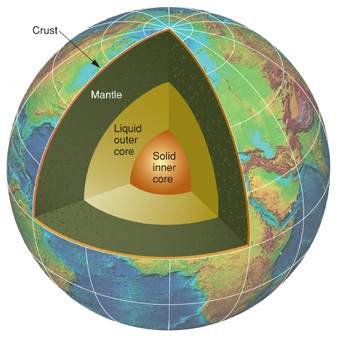 The mantle and liquid outer core are molten rock. The inner core is solid, but it too is hot. This heat moves through Earth's layers to the surface. In general, deeper permafrost is older. One researcher found that the deepest part of the permafrost underneath Prudhoe Bay, Alaska, has been frozen for more than 500,000 years. Frozen ground underneath the ocean is called subsea permafrost. What are the types of frozen ground? Frozen ground is can be either seasonally frozen ground or permafrost. Seasonally frozen ground freezes in the winter and thaws in the summer. More than half of the land in the Northern Hemisphere has some seasonally frozen ground. What are the types of permafrost? Continuous permafrost exists under almost the entire land surface in an area. 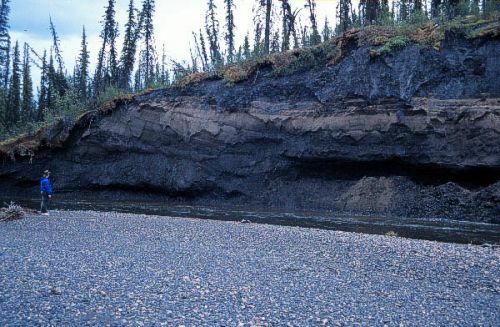 Areas with continuous permafrost often have permafrost layers more than 100 meters (330 feet) thick. The deepest permafrost ever found is in Siberia, a region in northern Russia. One area in Siberia has a permafrost layer that extends down 1,650 meters (5,413 feet). Discontinuous permafrost exists under a large portion of a particular area or only in a few specific places. Alpine permafrost is discontinuous permafrost that exists on the tops of mountains where the ground stays very cold. In areas with discontinuous permafrost, the permafrost layer may extend as deep as ten meters (thirty-three feet) underground. Taliks are sections of unfrozen ground within permafrost.